We are products of the past and we live immersed in the past which encompasses us. How can we move toward new life, create new activities without getting out of the past-without placing ourselves above it? There is no other way out: except through thought which does not break off relations with the past but rises ideally above it and converts it into knowledge. . . Only historical judgment liberates the spirit from the pressure of the past; it maintains its neutrality and seeks only to furnish light-it alone makes possible the fixing of a practical purpose; opens a way to the development of action. This volume catalogs materials on the history of quantum physics and related developments in theoretical physics. Many of these source materials now stand ready for use in depository libraries at Berkeley, Copenhagen, and Philadelphia. Professor Kuhn and his colleagues detail here what the source materials are and what they contain. They tell in addition of their intensive three-year work at collecting these materials. 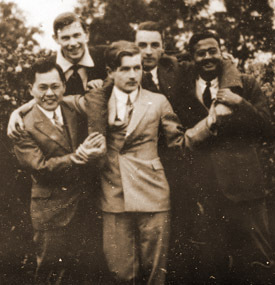 Not only did they secure letters, manuscripts, notebooks, and personal commentaries before loss or destruction; they also interviewed more than ninety men and women closely connected with the history of quantum physics and recorded and transcribed these interviews. Never in the history of science has so effective an effort been made to record decisive moments in the evolution of new ideas while key participants are still alive. The account by Kuhn, Heilbron, Forman, and Allen about the work of this unique project and about the use of its rich findings speaks for itself. But what is the importance of this project? How did it originate? And how was it sponsored and financed? It is a privilege to comment on these points in this preface. Complementarity and indeterminism, the quantum principle and relativity, together constitute the major scientific innovation of our time. They are key concepts in a revolution in scientific theory without parallel in the last three hundred years. Of all the advances that the mind of man has ever made towards "a complete harmonious account of human experience," none is more revolutionary. None has penetrated more deeply into the inner working of the machinery of the universe. These new concepts have dramatically influenced that branch of philosophy which is concerned with distinguishing the knowable from the unknowable. The discovery of the quantum principle and the discovery of the relativity principle both teach that man can learn-through his own investigations-to set a limit on what man can learn. Nor are only physics and philosophy being transformed. Rare today is a new product of chemical industry which was not first formulated in terms of quantum orbitals. No one can telephone today without using devices based upon the quantum principle. Almost all the basic novelties in the field of metallurgy and magnetic materials originate in ideas that came from quantum theory. Atomic bombs and nuclear reactors could not have sprung in a single leap from pencil and paper to dramatic reality in the absence of relativity and quantum theory. Many of the deepest considerations about biochemistry and the nature of life could never have been mastered without the quantum idea. These features rank the revolution in theoretical physics as one of the greatest achievements of the human mind. 1905. Einstein: special relativity, photon concept. 1913. Bohr: quantum theory of the atom. 1925. de Broglie: wave theory of mechanics. 1928-1930. Dirac: theory of electrons and holes. 1932. Anderson et al. : Discovery of the positive electron. One might anticipate that developments so central to modem civilization and so much to the glory of the human spirit would by now have been fully documented and described. Few expectations could be further from the facts. If it is true that ninety per cent of the physicists who ever lived are now alive, then conversely it is also probable that ninety per cent of the literature on the history of physics deals with work done by men now dead. Existing textbooks of physics, even the best of them, scarcely attempt to remedy the deficiency. More is known about nature than about how man finds out about nature. The investigator: What brought him success? What determination drove him to reconcile theory with observation? What force dragged him forward into the quantum present with his view fixed backward on the classical past? What did he count as the decisive issues? How was he led to new insights? What battles of ideas brought new enlightenment? There is a growing desire today for a comprehensive account of the history of physics. 1898-1933, that will answer these questions. New bits of historical insight increase the wish to have the whole story. There comes to light a letter in which Planck writes of his determination to obtain a satisfactory account of blackbody radiation in one way or another, whatever the cost. Bohr, we learn, troubled year after year about the problem of atomic stability, made many an order-of-magnitude estimate of factors likely to be relevant to atomic stability; and reflected deeply about the effect of radiation upon stability -so that ten days after he saw Balmer's formula for the wave lengths in the hydrogen spectrum he had won his way through to the quantum theory of the atom. Of the great controversy whether the spin of the free electron can be measured, something has reached the published records. Less has come to print about the still greater debates that hammered out the concept of complementarity. The student of physics loses by having no account of twenty major crises which actually occurred during the 1898-1933 period. How can one understand what quantum theory is today if he does not know how it developed? Many a young scientist lacks conviction about important points in workaday quantum theory, and is deprived of the deepest insights into the quantum principle itself, because he does not know the debates that settled these issues firmly for the fathers of quantum theory. He troubles over the same old issues indecisively and ingloriously. Neither physicist young nor physicist old can serve society with full effectiveness until the past has sprung into intense and unfolding drama before his eyes: the great men, the great struggles, the great ideas. These historical insights are not for scientists alone, but also for analysts of the creative process, and makers of government and university policy towards science. For the latter-those who direct the national expenditure of money and human energies-the history of physics speaks also of weighty practical considerations. Although research scientists may be reluctant to place a monetary value upon their work, physics has come to be a very great factor in the economy of nations. In our own country alone, this branch of science is now involved in activities affecting somewhere between $5 billion and $50 billion of the gross annual national product. Adequate historical studies of the decisive episodes in modern physics will advance practical as well as theoretical knowledge and will spark creativity in applied science, producing over the long term an increase in the effectiveness of physicists, engineers, and inventors. If this increase in practical productivity, based upon understanding of the pathways of scientific discovery, amounts to no more than one per cent annually, the money value of the history of physics, on this not too fanciful calculation, may be something like $50 million a year. Benefits to the economy, and to defense, and to discovery appeal to the mind. To the heart of the working scientist quantum history makes a still stronger appeal. The immortality of his heroes is at stake. With ever increasing frequency the physicist in his middle years has asked his colleagues, what can we do to capture the great dialogs and the great moments before they fade from memory? The bell has been tolling; time is short. Einstein died in 1955, von Neumann in 1957, Pauli in 1959, and Schroedinger in 1961. Edward Purcell discussed the need for collecting records with Gerald Holton at Harvard in 1958/59. Gerald Holton talked with Charles Kittel in Paris in 1959/60. At Seattle in the summer of 1960 John Wheeler discussed with Harry Wolff what might be done to set up a history project. At Berkeley in August, 1960, Charles Kittel, Thomas Kuhn, Hunter Dupree, Harry Wolff, and John Wheeler formulated a draft of a proposal. A second draft was prepare on 23 September, 1960. Both proposals envisaged a three-year project. Subsequent discussions with historians and physicists made it appear desirable to proceed in the following three stages: to secure first, the most distinguished and responsible kind of sponsorship under conditions likely to guarantee the soundness of the project and-in so far as possible-its acceptability to those from whom records would be sought; to pick the most capable head one could find for the project; and finally, to draft the final proposal. The genesis and early policy decisions of the Joint Committee may be appropriately touched upon. On the fifteenth and eighteenth of November, 1960, Richard Shryock and John Wheeler wrote to Dr. Karl K. Darrow, Secretary of the American Physical Society, and Professor Victor Weisskopf, then President, asking the Physical Society to appoint three members to the proposed Joint Committee. The Council of the American Physical Society met in Chicago on November 25 and empowered the President to appoint three or more delegates from the American Physical Society to meet with delegates from the American Philosophical Society. The two groups of delegates (K. K. Darrow, George Uhlenbeck, J. H. Van Vleck; and George W. Corner, Richard H. Shryock and John A. Wheeler) met on the twenty-first of December, 1960. Dr. Darrow announced at this preliminary meeting that the Physical Society had appointed three members to the proposed joint Committee and had placed $2,000 at its disposal. Dr. Corner, Executive Officer of the American Philosophical Society, agreed to ask the Philosophical Society to appoint three members and to appropriate a matching amount. On January 5, 1961, Erwin Schrödinger, winner of the Nobel Prize for his decisive contribution to the wave theory of matter, died at the age of seventy-three, a renewed reminder of the urgency of recording recollections by the leaders in the development of quantum physics before it should be too late. 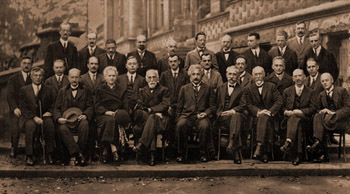 On January 31 the Council of the American Physical Society met. It took note that the proposed project did not in any way intend to prepare an "official history" of quantum physics but instead sought to collect source materials with the help of which others could then go on. It formally resolved to join hands with the American Philosophical Society on the proposed project. The Joint Committee first met in Philadelphia on the seventeenth of February. At this point attention turned with new urgency to the qualifications desired of a project director. Should the Committee search for a senior physicist who had retired and who might be willing to give a few of his final years to the collection of source materials? Or should it beg for a few years out of the career of a younger and still active physicist? Neither, the Committee decided, and for a simple reason: Leadership of the project should be an integral part of a professional career, not a digression or a mode of retirement. If possible the director should be a man who might himself exploit the materials assembled by the proposed project and who could train others to do so. Though the project was not itself to prepare a history of quantum physics, it was to maximize the chance that such histories be written. For these reasons, commitment to a long-term career of teaching and working in the history of science seemed one essential for the director. The other requirement was expert knowledge of quantum physics. Having agreed on these two qualifications, the Committee soon recognized that no one met them with more distinction than Dr. Thomas S. Kuhn, then Professor of the History of Science at the University of California at Berkeley (since September, 1964, Professor at Princeton University). Dr. Kuhn received his Ph.D. degree in theoretical physics at Harvard University in 1949. Among his works is The Structure of Scientiftc Revolutions (University of Chicago Press, 1962). 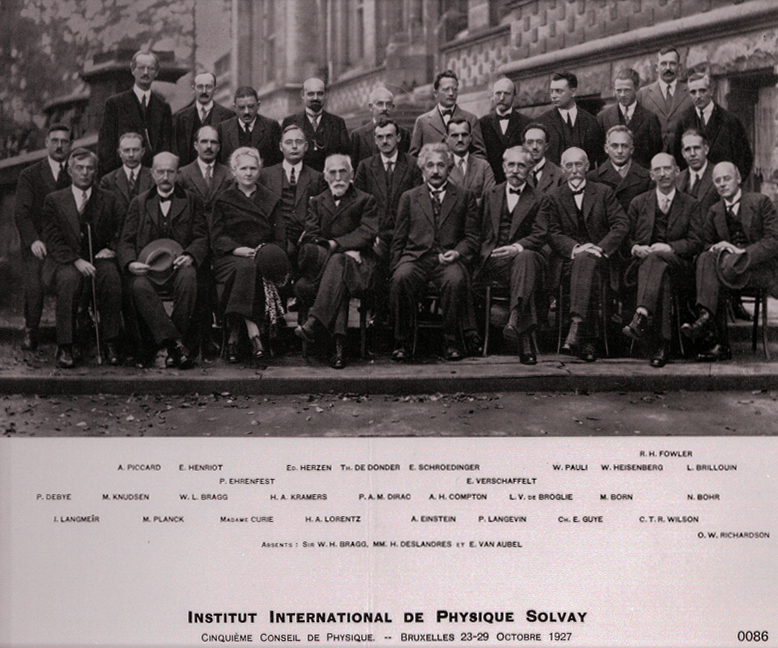 Professor Van Vleck, acting on behalf of the Committee, offered Professor Kuhn the directorship of the project over the telephone at the time of the meeting. He subsequently discussed the project further with Professor Kuhn on a visit to California in the period March 20-23. The second formal meeting of the joint Committee took place in Philadelphia on March 31 with Dr. Kuhn present. He agreed to accept the directorship of the project conditional on funds being available and with the understanding that the first and third years of the three-year undertaking would be carried out at Berkeley, the second year in Europe, and with certain additional understandings about assistants and deposit of working materials. Plans for the conduct of the project were discussed at considerable length. What to collect and how to collect it were central issues in this discussion. The published papers in which the elements of relativity and quantum mechanics were first announced to the scientific world are of course readily available. But proper history of scientific ideas can rarely if ever be written out of the original published papers by themselves. Though the historian starts with the papers, he cannot reconstruct the pattern of development without recourse to unpublished manuscripts, such as notebooks, autobiographical reminiscences, and letters. With respect to such personal materials, relativity and particularly quantum mechanics present the historian with problems of unprecedented magnitude. During the twentieth century standards of professional publication have become more and more impersonal, and it is now harder than it has ever been to get from published sources hints about how ideas started and about how they developed. In addition, since World War I there seems to have been a marked decline in the role played by personal correspondence. Increasingly, conferences and the telephone have displaced the letter as the means of informal scientific communication. Finally, partly because of the speed of scientific advance, partly because of the esoteric nature of the emerging theories, certain segments of the physics community have been overwhelmed in recent times by the pace of the new developments. For a time they have turned away from the history of science. There is a notable lack of autobiographical lectures, articles, and books of the type that the eighteenth and nineteenth century make so familiar. The historian who wishes to examine the development of scientific ideas in the years after 1915 may well find fewer of the relevant research materials than the historian of science working on any other period since 1700. To remedy this deficiency in source materials and to open the doors to a new understanding of how science operates, it was agreed that the project should seek to ensure the preservation of whatever manuscript materials remain; to record recollections and commentary by the living participants and their close associates; and to prepare for publication a catalog of this material and otherwise to facilitate access to it, for example depositing originals or photoduplication of suitable parts of this material in the libraries of the American Philosophical Society and of the University of California, Berkeley. Subsequent to the March 31 meeting, consultations between Thomas Kuhn and John Wheeler and the other members of the Committee resulted in the recalculation of the original project budget to include realistic allowances for staff and other help and travel and photoduplication. The American Institute of Physics gave important help in developing the financial estimates. It also agreed to the request of the joint Committee to serve as party to the proposal and to administer any grant that might be received. The final proposal was submitted by the joint Committee and the American Institute of Physics to the National Science Foundation in June, 1961. Thanks to previous consultations with the National Science Foundation and to its deep concern with the history of twentieth-century science, it granted the funds requested for the period 1 July, 1961, to 31 June, 1964. Since then it has provided a supplementary grant to permit retrieval of residual source materials in Europe in a terminal two-year project during the period 1964-1966 under the direction of Professor Friedrich Hund of the University of Göttingen, a distinguished physicist and pioneer of the great days of quantum physics. Both grants were made by the National Science Foundation to the American Institute of Physics. The chairman of the joint Committee was listed pro forma as "chief investigator." Questions of policy have been the responsibility of the Joint Committee. The actual day-to-day making of contacts, decisions on procedure, collection of materials, and oversight of their cataloging have been entirely the responsibility of the project director, Professor Kuhn. To him and his associates, the Joint Committee of the American Philosophical Society and the American Physical Society expresses its thanks for a great work well done. Grateful appreciation is expressed to the National Science Foundation for its unfailing support, moral and financial, without which the project could not have been carried through. Thanks go also to many friends of the joint Committee for help, among them Mrs. Mary Bostain of the National Science Foundation, Dr. Donald Coney, Director of the Library of the University of California at Berkeley, Mrs. Gertrude D. Hess of the Library of the American Philosophical Society, Mr. J. Kellum Smith of the Rockefeller Foundation, and Professor Roger Buck of Indiana University; to the University of California at Berkeley, host to the project for two years, and to the American Institute of Physics, steward of the project funds, source of counsel, and friend not only of this project but also of a quite distinct, complementary, and important Project on the Recent History of Physics in the United States, which is often referred to as the "AIP project," and which is touched on more fully in Chapter I. There is no way to thank Niels Bohr for his contribution to the enterprise recorded here. He took two hours from a crowded three-day visit to New York in June, 1961, to review project plans, give his staunch support, and invite the project staff to spend its European year at Copenhagen. When the time came, he provided quarters near his dwelling for what turned out to be a very substantial enterprise. He worked hard at reviewing the record of quantum history for this project. He gave Professor Kuhn four tape-recorded interviews, the last of them with mind as clear and dialog as emphatic as ever on Saturday afternoon the seventeenth of November, 1963, the day before his death. His letters and writings will stand forever, greatest of all contributions to the records of quantum physics.